This is weird. I was feeling weird. I made this after my son died. I felt kinda broken and lost without him. So I made Skully. I still have him. 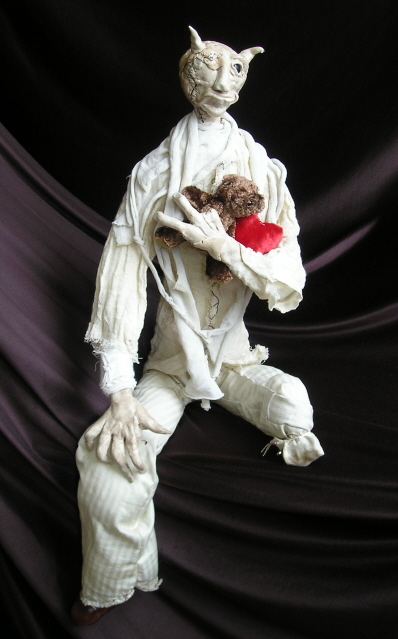 He is made with a Shan-armature of wire, tape and stuffing. His head and hands are polymer and he was glazed. 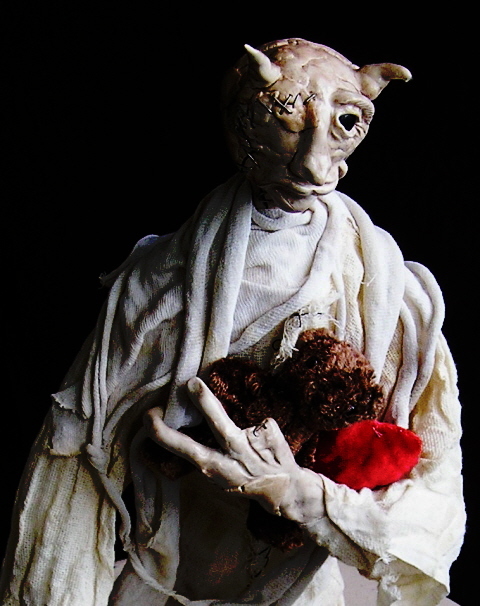 I dyed his rags with tea and purposely made them ratty. After I finished this piece it made me think of all the kids I had seen living in the pediatric oncology ward for four years. Everyone was messed up. Children with missing limbs, big cracks and sutures in their skulls from removal of brain tumors. You name it, I seen it. It is the stuff that nightmares are made of. Only the super brave can walk the hall of pediatric oncology and survive it mentally. A bulk of my faith left me when my kid went to radiation for 16 days and I had to watch his bone marrow be burnt out of his 4 year old skeleton. it was absolutely terrifying. A bone marrow transplant in not something anyone should ever see.